Dr Christina White is a veterinarian that is currently practicing at the Riverbend Animal Hospital in Hadley, Massachusetts. She worked with me for a few years while in Pennsylvania before her relocation and I have the privilege of calling her a dear friend. I recently visited her and her family, both human and furry, a couple months ago on a slight detour en route to a Kripalu retreat. She and I caught up on old practice gossip, our career paths and we caught up with life. Today, I got a message from her stating that this next video takes my client education tooth brushing spiel “to a whole new level”. 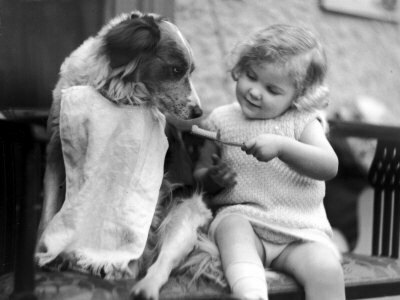 Usually, when a client states that it is impossible to train a cat or dog to tolerate tooth brushing, I share the video of my brushing my vicious cat, “Crayons’s” teeth (contact me through the website if you want a copy of the video file for your clients). 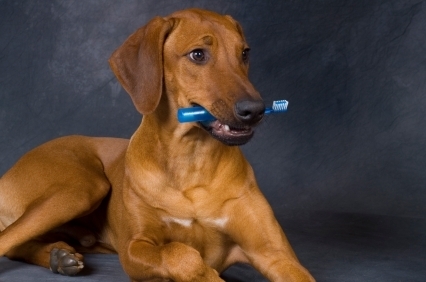 I share with the clients that tooth brushing is just another trick you can teach a pet…like roll over, play dead, fetch the newspaper. With patience, consistency, breaking up complicated training into baby steps and a positive reward system, you can teach an animal to do most anything. Watch this video and I think you will see where she was going with her tongue planted firmly in her cheek. Enjoy! And…don’t for a minute think that I am not going to use this video in my client education dentistry seminar for fun!